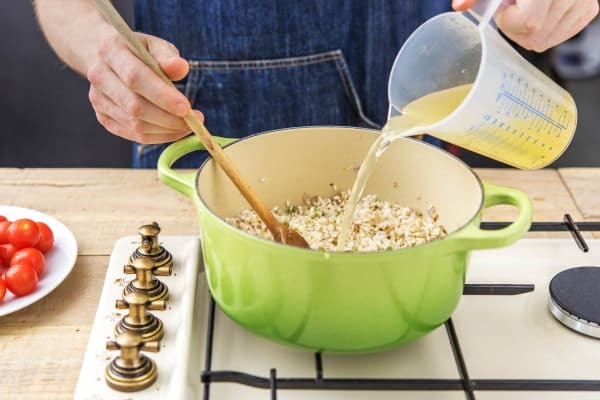 Risotto is so delicious, but the prospect of all that stirring can sometimes be a bit daunting. Chef Mimi to the rescue! She's simplified the process and created this recipe that can be baked in the oven - all the creamy, luxurious texture with none of the elbow work. If that wasn't enough, it also boasts the crowd-pleasing flavours ! Preheat your oven to 200°C and pop your kettle on to boil. 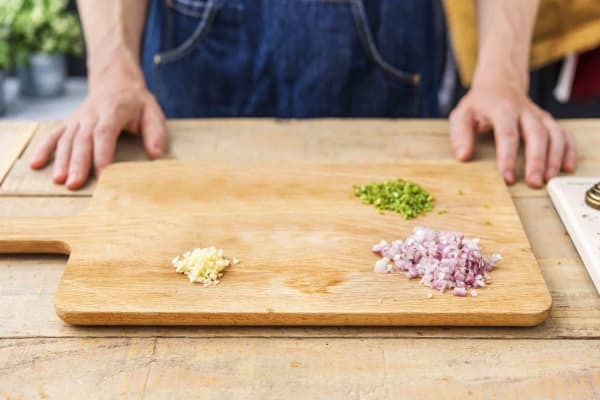 Halve, peel and chop the shallot into ½cm pieces. Peel and grate the garlic (or use a garlic press). Roughly chop the parsley. Set the leaves aside and finely chop the stalks. Heat a drizzle of oil in a large ovenproof pan over medium-high heat and add the shallot. 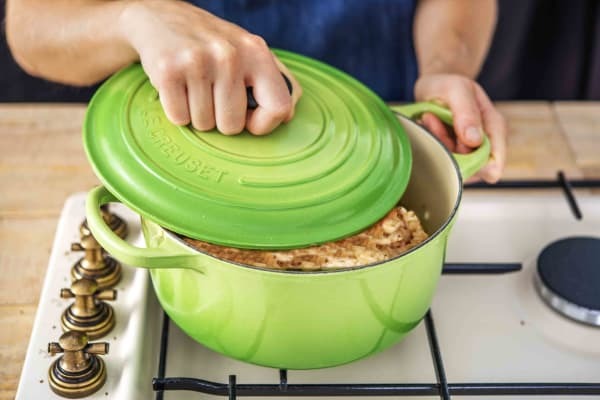 TIP: If you don't have an ovenproof pan, just cook in a normal saucepan then transfer to an ovenproof dish before the risotto goes in the oven. Stir and cook until softened, 5 mins. Add the garlic and cook for 1 minute more, then add the rice and parsley. Stir and cook until the edges of the rice are slightly translucent, 1-2 mins. Measure out the boiling water (amount specified in the ingredient list) and add the vegetable stock pot. Stir to dissolve the stock pot and pour into your rice pan. Add the tomatoes, bring back to the boil, then cover with a lid (or some tightly fitting foil). Pop on the top shelf of your oven and bake until the rice is cooked and the stock absorbed, 20-25 mins. While the risotto is cooking, halve the lemon and squeeze the juice into a large bowl. Add the honey and olive oil (amount specified in the ingredient list) and whisk together with a fork. 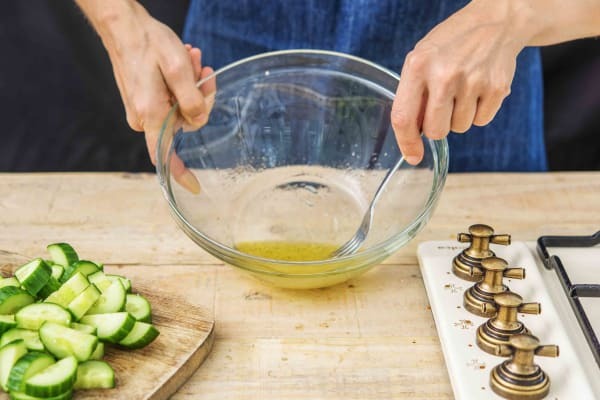 Quarter the cucumber lengthways, then chop into 2cm chunks. 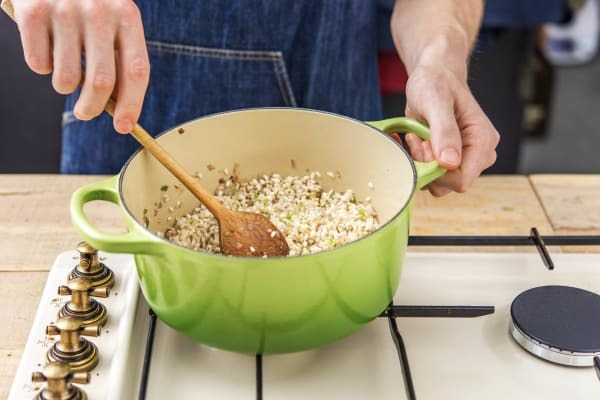 When the risotto is cooked, remove it from your oven. Carefully take the lid off the pan and stir in a knob of butter (if you have some) and the Italian style grated hard cheese. Taste and season with salt and pepper if you feel it needs it. 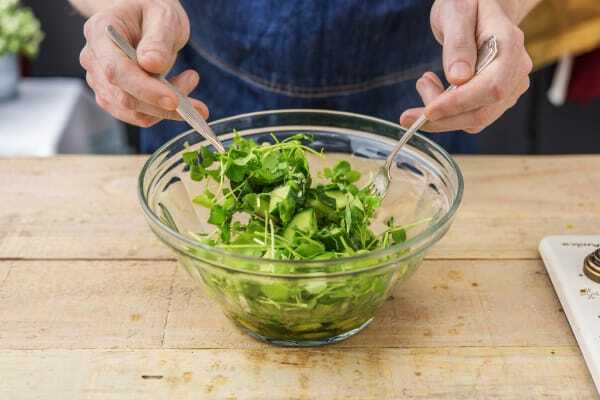 Add the cucumber and pea shoots to your bowl of salad dressing and toss to coat. 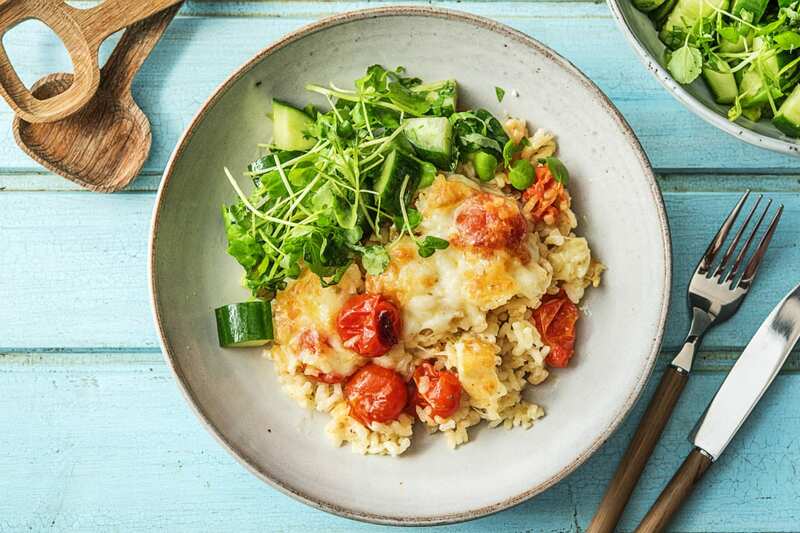 Serve the risotto in bowls with the salad alongside. Sprinkle over the remaining parsley. Enjoy!